Preparation of cream for Esterhazy cake. Place the milk in a pot to boil. Meanwhile, yolks, sugar and corn starch are mixed in the bowl. Stir with a wire stirrer until a thick slurry is formed. A boil of milk is poured into it. Everything goes back to the pot and put on a moderate hot plate. Stir continuously with a wire stirrer until the mixture thickens and begins to boil. The cream is removed from the hot plate and the lemon peel and the alcohol are added. Stir well and transfer to a tray or other suitable container. Cover tight with stretch film and allow to cool completely. The butter crashes with a mixer until it becomes fluffy and lightly glows. A portion of the cream is added to it and crushed again until it is absorbed. Add all the cream and crumble until a smooth cream is obtained. 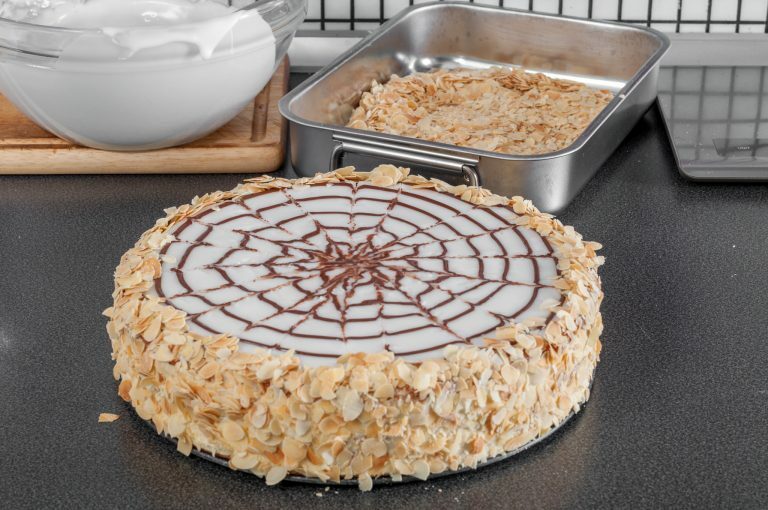 A cardboard cake mat is placed in a 26 cm diameter with moving walls. At the periphery of the form, an acetate band is placed. A card is placed on the cardboard pad. Cover with 1/4 of the cream. Place a second board, cream and so alternate as the cake ends on a board. The marmalade of apricots is distributed over the top plate. If it is very dense, it is warmed up before coating on the board. If the marmalade is bumpy and there are hairs or small pieces of fruit remaining in it, it is heated and passed through a strainer before it is distributed on the board. Cover the cake tightly with stretch foil and leave in the refrigerator overnight. Preparing the fund is easy, but working with it is then a little more difficult and requires some practice. If you think it will be difficult, you can use an alternative option to cover the ice cream cake. A recipe for it you will see at the bottom. The sugar in the casserole mixes sugar, water and glucose. Heat up to a moderate to strong stove until the mixture boils. It varies until it reaches 114ºC. The syrup is immediately poured into a kitchen robot and allowed to cool to 60 ° C. When the syrup is cooled to 60ºC, the robot is released at full power until the mixture becomes white and dense. Immediately transfer to a thick plastic bag, best with zipper. From the envelope, as much air as possible is sealed. 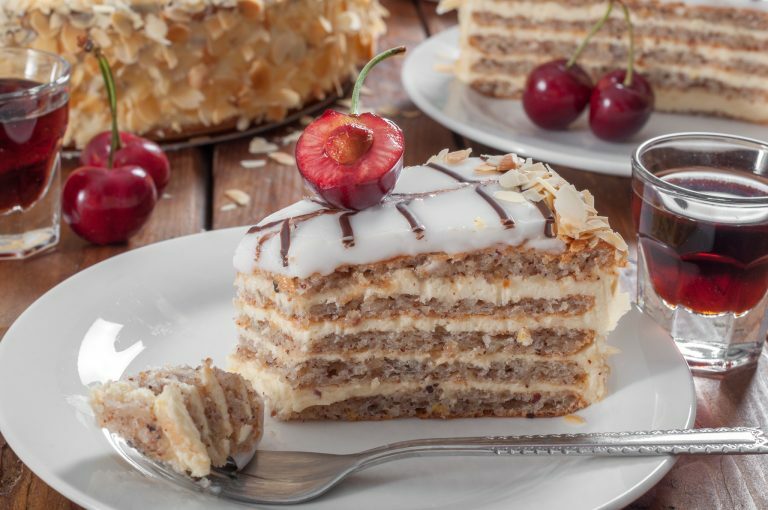 Recipe for preparing Esterhazy cake, necessary products and assembling of cake. The fund can be stored in a refrigerator and can be prepared up to one month in advance. Before use, it is necessary to warm up in a water bath and dilute with a little water. For this amount of fondant you need 4 teaspoons of water or 20 grams. Here’s how it works: Fonadent is removed from the envelope and broken into a bowl suitable for a water bath. To it add 20 grams of water and the bowl is placed over the water bath. When the fondant is heated, stir until it becomes smooth and fluid. This is the moment when it should be used. If it is colder, it will tighten quickly after it is applied to the cake and can not be distributed. If it is too hot, it will spill over the cake and will not be able to hold on to the appropriate thickness on it. Once the assembled boards and cream stay in the refrigerator overnight, the cake is ready to finish. It is released from the form and the acetate strip is detached. It is good for the sides of the cake to be leveled with a pallet knife. The fondant is placed in a water bath and diluted with water as described above. Meanwhile, the chocolate on the pattern is melted in a water bath and placed in a sweet cornet. When the fund is sufficiently warm, pour into the middle of the cake. At this point, it is quite liquid and will flow itself to the periphery of the cake. However, it is necessary to help him a little with a pallet knife. This has to be done very carefully without pressure. Immediately with the pastry chocolate on the cake, a spiral is made, starting from the center and ending to the periphery. With the help of a wooden skewer the characteristic patterns are made in the following way: with the tip of the skewer passing from the middle of the cake to the end. Following is the reverse movement from the end to the middle. This is done along the entire surface of the cake. Finally, the cake is covered with a baked almond stick. (The almond is baked in the oven at 180ºC for 5-6 minutes, stirring periodically.) The cake is kept covered in the refrigerator for up to one week. Sugar powder is sifted and lemon juice is added to it until a tight, but slightly liquid, glaze is obtained. One tablespoon of it is separated and mixed with the cocoa, if necessary diluted with a little more lemon juice or water. Cocoa glaze is placed in a sweet corn. White glaze is distributed on the cooled pastry using a pallet knife. With the cocoa glaze in the cornet, a spiral is made starting from the center of the cake and finished to the periphery. With the help of a wooden skewer the characteristic patterns are made in the following way: with the tip of the skewer passing from the middle of the cake to the end. Following is the reverse movement from the end to the middle. This is done along the entire surface of the cake.